Marin County sits along the San Andreas fault, and as a result it has some rugged coastlines and steep mountains backing the sea. There is also a nice gap in the hills at the Golden Gate, where the fog flows inland. These conditions result in some fine photographic opportunities if you know where and when to look for them A landscape photographer could spend an entire lifetime here and still have more to see. The last light of the day broke through the clouds and lit up the side of cliffs and rock just after a late winter storm. 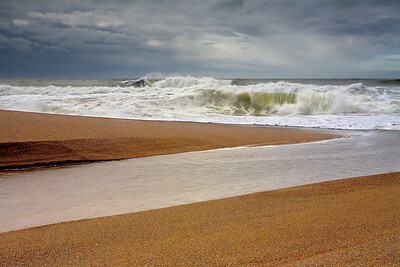 Large waves driven by high winds often combined into even larger waves as they pounded the soft sand. It could not have been a more dramatic sunset. 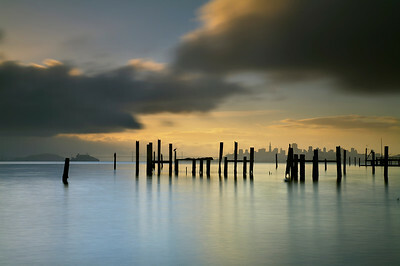 A winter storm begins to clear at sunrise over the San Francisco Bay. The openings in the clouds created a light show for just a few minutes and then the clouds cleared away leaving a clear and sunny day ahead. 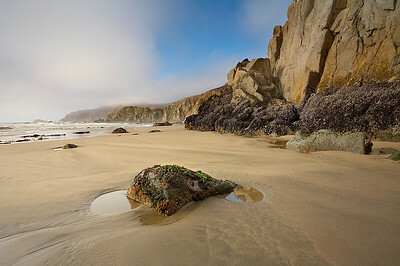 Tennesee Valley Beach near Mill Valley, California has incredible textured sand and brilliant cliffs of gold in the right light. Normally this is in the shadows and appears dark, but in the morning and after sunset, the colors come out. 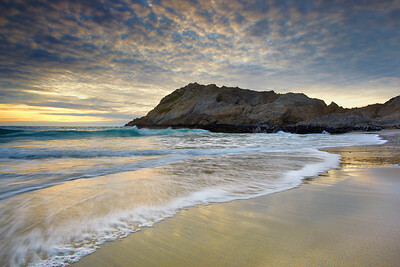 It is a very scenic 40 minute walk from the trailhead in Mill Valley to this beach. Along the way, you can see babcats, owls and lots of other wildlife. 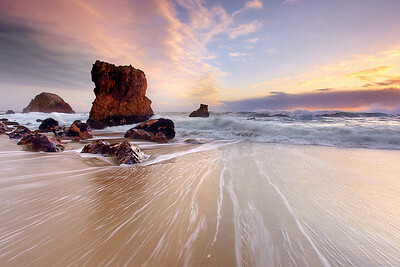 The beach and cliffs are multicolored and dramatic. The colors you see here are natural and show up best on a rainy and cloudy day, just as a wet rock has better color than a dry one! 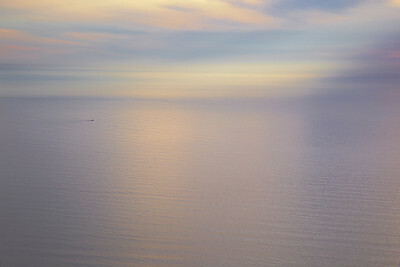 When viewed from the Marin Headlands, the sea seems to go on forever! Usually when I find a good composition and the light is looking right, I make a commitment to wait for the best light for that particular scene. That is because I used to run around trying to get as many shots as I could with good light, and I would get home and realize that I had 5 different compositions but only one had good light. So I would delete the rest of them and return later to try for the other ones. 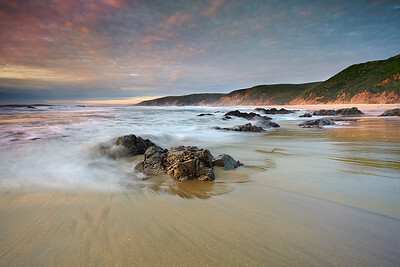 I often try to show a good solid bit of rock or some finely detailed sand in the foreground of a seascape image. However, I noticed how there was a brief moment where the combination of the golden sand in the water and the reflected sunset turned the water into gold. So after several failed attempts, with the water often getting to near the top of the tripod and inches away from the camera, I finally captured the image I hoped for! 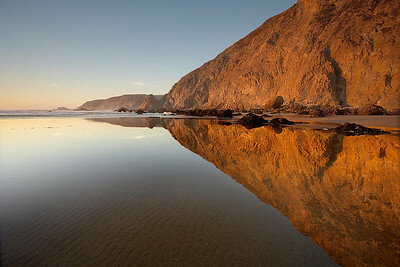 McClures Beach is a great place to go for low tide if you wish to capture the sand at it most reflective state. 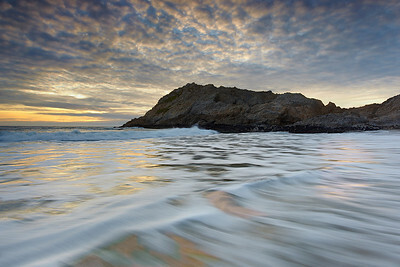 Add in some big winter waves, a dramatic sky, and some good timing and it is possible to capture a nice seascape. You have to get wet to get in close enough to show the turbulent sea. I also wanted to show how the similarity between the foreground rocks and the background rocks. 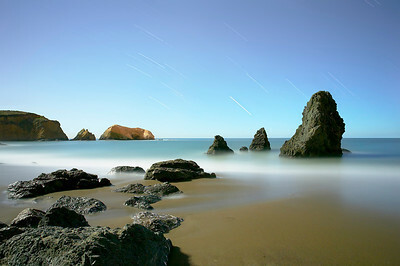 This long-exposure image was created under a 3/4 full moon about 1 hour after sunset. It allowed the moon to light the seascape much as the sun does during the daytime. The waves have been reduced to a haze and the star trails indicate how much each star had moved during the exposure. It was a warm night and after a while, my eyes became used to the darkness and I could see the faint blue in the sky. This is how it felt to be out here, alone at night in an alien place. In order to get a properly exposed photograph at night, a lot of experimentation is required. In previous outings at night with strong moonlight, I tried exposures from 5 minutes to an hour. 30 minutes is just about right with this amount of moonlight and the aperture nearly wide open at F5 with ISO 50. Under a quarter moon, perhaps an hour is necessary. Changing the ISO to 200 reduces the exposure time and also produces less heat sensor noise, which is different than regular ISO noise. I use ISO 200 now as long as I can get an exposure of at least 10 minutes, to show movement in the stars. 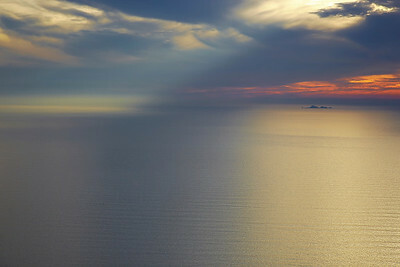 The sun lit a path over the sea to the Farallon islands, 17 miles off the Marin County Coast. This only happens at very specific times so I feel fortunate to witness it! This was taken 2,000 feet above sea level. The sun rises through layers of cloud and fog and reflections off of the bay waters on a warm November morning. I used a short exposure to capture the detail in the water and sky. The reds were slightly desaturated to retain detail. 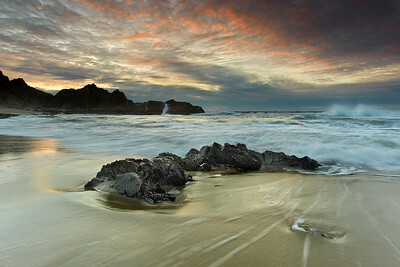 I have always liked to visit McClure’s Beach to see the dramatic wave action. But it is usually too violent to get a good shot of it. On this evening however, low tide and a partly cloudy sunset allowed me to capture the light on the rock and water without getting drenched. The warm tone of the light showed off every detail and color in the storm-beaten rock at it's best. Once I had a good view of the rock, I waited for the best light and then timed the wave to show how the water moved around the rock. 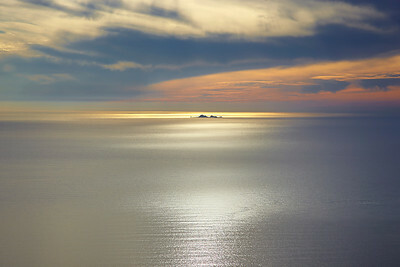 A beam of light shines apon the sea as the Farallon Islands are lit by more shimmering light. This is a view from the top of Mt. Tamalpais at 2100 ft (700m) above sea level. 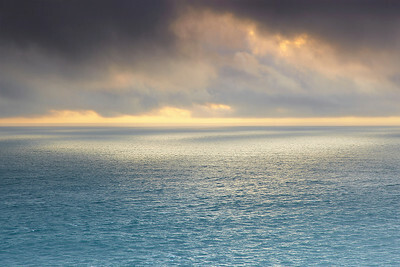 An opening in the clouds allowed the sun to shine like a spotlight on the sea as a fishing boat headed out to the fishing grounds. This is a view from the top of Mt. Tamalpais at 2100 ft (700m) above sea level. This photo was taken in a cave that can only be reached during an extremely low tide. Normally the rock and starfish are covered in water even during a normal low tide. I positioned the camera so that there is a hint of reflection in the little pool to the right of the rock. Kehoe Beach has numerous tide pools during a very low tide. And it also has some nice flat sand that is perfect for reflecting the red cliffs at sunset. I have been here many times even at low tide and not seen it like this. And even on this day, it was only like this for a few minutes. 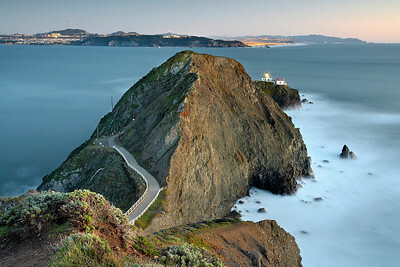 Point Bonita is located at the northern entrance to the San Francisco Bay. The original name was in fact "Point Boneta" - a reference to the resemblance of the area hills to the hats worn by Spanish religious officials. 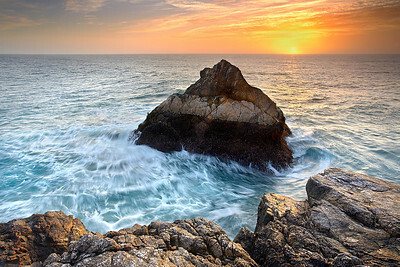 In 1853 the steamship Tennessee ran aground just north of Point Bonita, and the clipper ship San Francisco struck the rocks of Point Bonita and sank in 1854. So in 1854, work began on the lighthouse. The point was very difficult to reach due to the steep cliffs. Eventually, a tunnel was built. The lamp was lit for the first time on May 2, 1855. I needed and extra long exposure to smooth out the ocean enough to avoid that cottony effect and have the rocks stand out from the surf. The light at sunrise was spectacular following an unusual October storm. 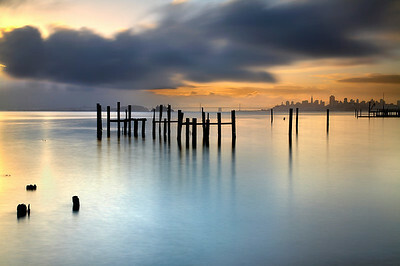 I arranged the posts in the frame to make a diagonal line pointing towards the city. 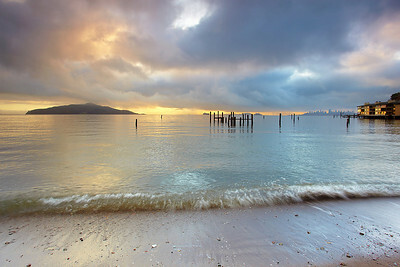 The extra long exposure softened the clouds and water to enhance the impression of how it felt to be there on this morning. Without the two stacked filters, the exposure time would have been about 1 second and that would have made the water look rather messy. Also, I still had to use a ND grad filter to darken the sky in relation to the water just as I would have had I not used the two stacked filters. After making #1, I planted the tripod in the sand (only possible during a very low tide) at an angle where important parts of the skyline and bridges are not cut off by the posts. 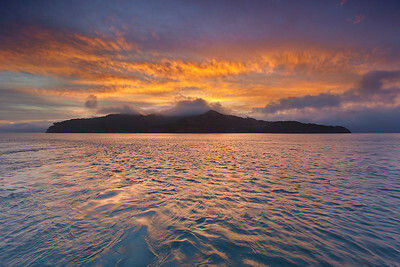 The light at sunrise was still spectacular following an unusual October storm. Normally, it is not a good idea to have things blocking the overall view of the background, but here it seems to give a 3d effect. 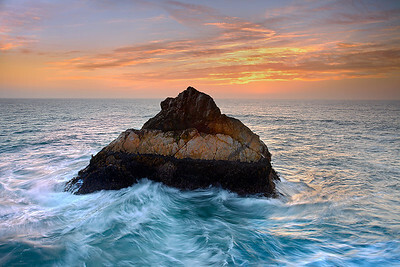 In this photograph, I wanted to show the movement in the water and some good detail on the rock face. The water curling around the rock was particularly eye catching so I concentrated on capturing it at the most dramatic moment. I experimented with exposure times ranging from 0.1 seconds to a full second. A 0.5 second exposure produced the most graceful brush strokes of motion. This image was made just after Pyramid Rock #1 which shows the cliff, but here I just wanted to show the sweeping motion of the sea. A got down low on the cliff behind me in order to have the tip of the rock break the horizon. It made the rock feel a little closer and it brought more attention to the water motion in front. It was a beautiful evening to hang off a cliff to try to get this shot. 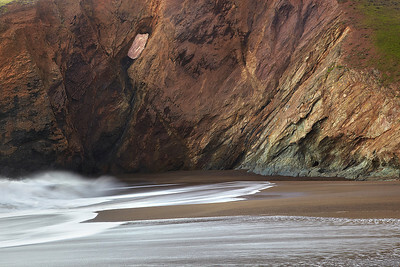 Rodeo Beach, just north of San Francisco often takes the full brunt of storms off the Pacific ocean. After a series of storms, the lagoon overflowed and created a stream across the sand. I liked the striking patterns it made and waited for the surf to show lots of detail. 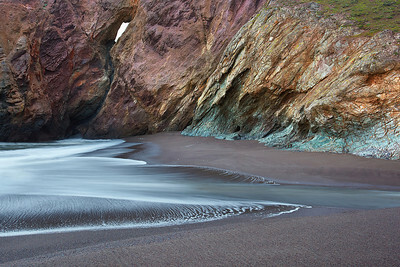 This black sand beach just west of the Golden Gate bridge is nearly as black as any on the Big Island of Hawaii. It has a bit of brown and red in it as well. 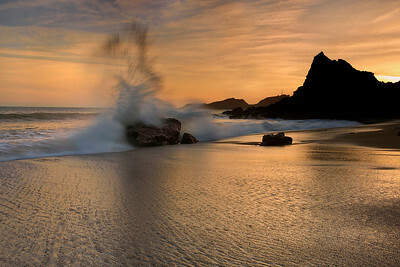 Here, I tried to capture that moment where the sand turned golden just as a wave pounded the rock. The beach is steep and the water moved fast, so it was difficult to set up the tripod and get the shot without being overwhelmed by the water! 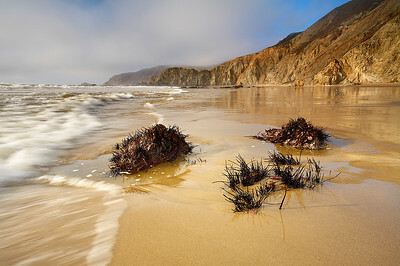 This beach south of McClures Beach and north of Kehoe Beach in the Point Reyes National Seashore can only be reached during an extremely low tide. That is when interesting features such as those in the foreground are exposed. The sea was quite violent despite the low tide. An hour later this beach was completely inaccessible but I was back on the main part of the beach by then! It would be quite dangerous to get stuck in this place. The cliffs are steep and crumbly and the surf gets huge here.